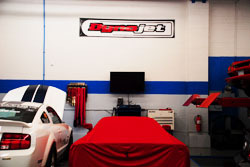 P1 Motorcars uses the industry standard, Dynojet 224xLC. 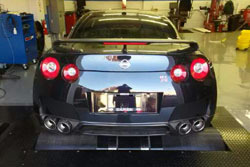 Advanced dynamometer tuning is an essential diagnostic tool required by anyone who’s serious about power & performance. Dyno rates are $140 for the first hour & $120 each additional hour (wideband 02 included) special rates for group/car clubs are available. 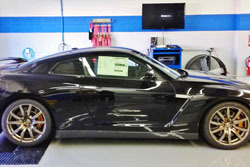 Flat rate for the AWD GTR is $275 for the first hour & $120 for each additional hour, also available are data link, and also analog module for monitoring boost, fuel psi, etc. Our 224xlc has the capability to absorb 1,000 hp with it’s single eddy current retarder. sweep tests, as well as custom step tests are possible with this dyno. The dynojet in inertia mode can handle upwards of 2,000 hp. P1 Motorcars exclusive Dynojet 224 XLC is equipped with full data acquisition and load control device, including basic instrumentation and controls and specially designed desktop systems and interfaces. All of our data acquisition and control systems are providing a comprehensive, easy to use system in a familiar environment. P1 Motorcars knows the basics and beyond of Electronic Fuel Injection (EFI) systems, including all the theory and mechanics in an easy to understand format for Dyno Live Tuning. We tune like with hands-on experience using the leading software and tuning products both in house and major tuning companies.